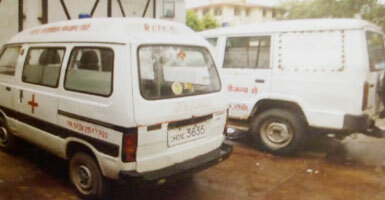 RIMS presently has 6 ambulance which are 24*7 ready to serve their purpose. There are two types of ambulances- 3 general and 3 cardiac, which are provided with Oxygen cylinders, temporary pacing equipments and first aid kits along a nurse for the benefit of the patient. The ambulance fares and can be availed by general public at nominal fares and can be availed by calling on the Ambulance Helpline No. 0651-2547260.